Oceanfront Family Gem - Single family house on 2 large open space lots. Our home is on the ocean, protected by a lava wall and tide pools with an incredible 270-degree view looking north to Kailua-Kona and south to Kahalu'u Park on Keauhou Bay. Views of the ocean and gorgeous sunsets can be seen from every room in the house. The porch is a family-favorite for breakfast, lunch, reading, napping, and sunset dining. Excursion boats, deep sea fishing and snorkel boats and spinner dolphins pass directly in front of our home. During the winter months, migrating and breaching humpback whales are seen from the porch. The upstairs has an open, full kitchen with granite counter tops and bamboo flooring which opens to a dining room and living room. Cooks in the kitchen can view the ocean and mountains while cooking. Upstairs has a master bedroom with queen bed and bath. Two bedrooms - one with king bed and the other with two double beds - are downstairs. The downstairs bedrooms share a large tiled bathroom with a huge shower with double heads. Both bedrooms open out through sliders into the garden and ocean. All three bedrooms have ocean views while lying in bed. The most-popular picnic and snorkel beach of Kahalu'u Park is 1/2 mile south. Body surfing and surfer activities are found at White or Magic Sands Beach, 1/2 mile north. Off the front lava rocks, one can drop into the water to scuba, snorkel or kayak. Masks and snorkels, towels, boogie boards, fishing equipment, beach chairs, hammocks, portable BBQ, coolers are provided. We have cable TV upstairs and down, as well as internet. Our home is on a double lot on the ocean so you'll have a bit more privacy and, if you have kids, they have a grass yard to play around on. Please contact owner by phone or email before placing on line bookings. My father visited the Big Island first in 1928. He finally found this dream home in 1962. I started coming to Hawaii in 1962 and through the years have both worked as an engineer for OTEC and vacationed in Hawaii. Management of the home has now evolved to me and Misako originally from Hiroshima Prefecture. We enjoy the correspondence with guest many of whom return every year. We invite you to contact us should you wish to learn more about the house. This property is ocean front and huge! There is a rock beach space between the house and the water. Ancient Hawaiians made this the point there fishing base which is evident from the many mortars carved into the rocks. The point provides a safe entry and exit from the water. The view from the porch is 180 degrees of 100% nature. The site is old Hawaii. 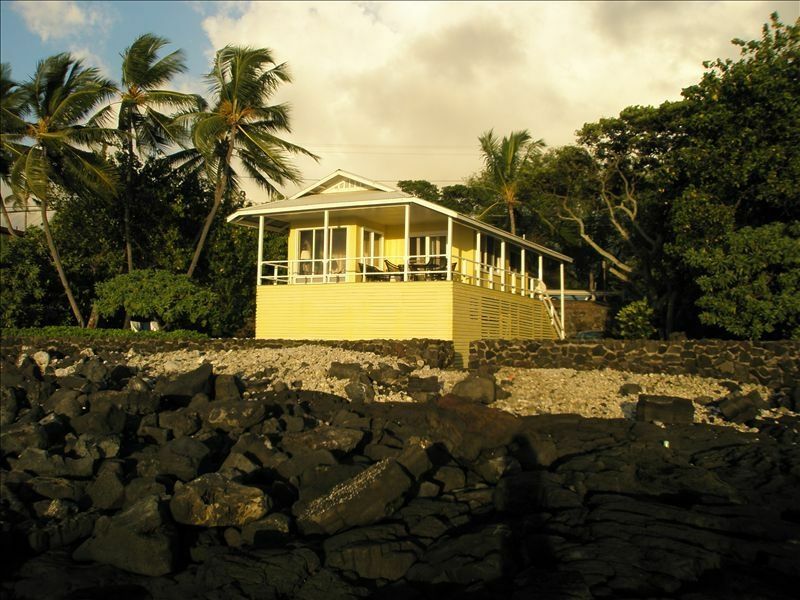 The house is a classic Hawaiian / Japanese influenced single wall beach home style built in 1948 by Earnest Kabota, whose home was in Hilo. Earnest enjoyed the lifestyle, weather and fishing in Kona. Across the street towards the mountains (Mauka) is a undeveloped 7 acre parcel that provides a natural view from the kitchen. Parrots often roost in the trees there. A family of Grouse is often seen and heard. The view, sounds and feeling is very calming and relaxing from the moment of arrival. A coral and lava stepping stone path by the side of the house leads through a wall opening and out to the ocean. The lava flow extends about 200 feet out to a point which one can stand on and look down at the fish swimming. It's easy to jump into the water and swim in front of the house to look at fish. Many commercial site seeing post often congregate off in front of the house because this is where dolphins often rest and play. You can see out to the ocean while using the bathroom, even while standing in the shower. The coast in front of the house consist of a small point and small bays are formed on either side. Coral is washed up at a wall adjacent to the house. On the ocean, protected by lava rock wall and tide pools. The water in front of the house is the Pacific Ocean and is on the west side of the Big Island. Sunset is looking straight out from the house. There is parking for up to 6 vehicles. New 22 cubic foot refrigerator / freezer. New oven, smooth stove-top surface. We have espresso and 10 cup drip coffee makers. House includes a full pantry of staples, spices, baking needs. Enough dishes and utensils for a crowd, to include small Asian serving bowls and chopsticks. Views of the ocean and Hualalai, a dormant volcano can be enjoyed while cooking. There is an excellent library of Hawaiiana to include marine life, birds, geology, flora, fauna, history, travel, kayaking, hiking, cookbooks and travel guides. Stroller, car seat, swing set, beach toys, flotation devices, life vests, barbie bike, Port-a-crib and beach tents. Outdoor BBQ pit for roasting mash-mellows along with lawn chairs is located out in yard overlooking ocean. A two-man kayak with life vests and paddles is available. With amazing ocean view and sunsets. We have a Stand Up Paddle-paddleboard. Two sets of golf clubs are available. Nearest golf course is 2 miles south of house. At ocean edge. Private driveway. Very private surroundings on double lot with large lawn and garden. Site of former Hawaiian settlement with old Hawaiian dry stack walls. Trees for hanging hammocks. Tide pools and easy access into water for snorkeling and kayaking. Right on the water and just far enough out of Kona to get out of most of the noise and crowds. The house is lower than the road which creates a natural barrier from people walking by. Keeps kids in the yard and away from traffic. Grocery store is 1.5 miles away. Protected snorkeling bay is within walking distance. Easy parking in front of the house. I can't say enough about how perfect the location is. * The house is older, so don't expect the Sheraton. Old rusty door knobs, outdated cabinets, etc. To me it added to the charm of the place. It's a classic old beach house. I loved it. * No beach but plenty of tide pools and rocks to climb on and explore. I have teenage kids so they loved it and could get in and out of the water right in front of the house. My mother was too old to navigate the rocks so she mostly stayed on the deck and watched. Take little ones down to Kahalu'u beach park. * No A/C. Not that I cared. I liked opening up the windows and letting the ocean breeze in. I slept really good. Birds will wake you up in the morning chirping right outside the window but is that a bad thing? * There is a stand up paddle board and kayak available but if the surf is high it might be too difficult to get in and out of the water through the rocks. * Boogie boards, snorkels, masks, fins, aqua shoes, beach towels, coolers, kayak, paddle board, chairs, charcoal bbq, etc, etc. It's all there ready to use. * We scuba dove at 2 step, 4 mile Alii, in front of Kona Beach Bungalows, and at the house. We found in front of the house to be the best of all 4 spots. * Tidepools come alive at night. Take flashlights and explore. cowries, crabs, eels, and even an octopus at night right in front of the house. * Birds come and visit all day. If you sit on the deck, expect little finches to land on the rail and wait for you to drop crumbs. There were also a pair of Franklin's (type of partridge) that hung out at the house. * Archeological site right on the property!! * My brother stayed at the Sheraton and his kids only wanted to come hang out at the yellow house. * Occasional locals fishing from the rocks. Be nice and they are happy to share their culture. One even showed us how to catch crabs with simple string! * Talk to the owner Tim. Nice guy. You won't be disappointed. Charm and Relaxation at the best beach house on Kona! We had a wonderful family Christmas. Our party consisted of 6 adults. We enjoyed the location, the fully equipped kitchen and the deck! We did several day trips and spent a number of days closer to home. We appreciated all the items such as beach towels, coolers, beach chairs, binoculars etc. On our last day we saw whales and dolphins from the deck which was a highlight. The house is located close to a busy road (particularly busy at Christmas time) which was not an issue for us but some may not like it. This is our fourth vacation rental on the Hawaiian Islands and our favourite. Ocean front location. Tim communicated wonderfully and answered any questions we had in a timely fashion. When renting a vacation home it comes down to expectations. We tend to go with quirky or unique rentals when we travel so this looked right up our alley. The location was great with 2 exceptions, 1st was the main road about 50' outside the upstairs bedroom, 4 or 5 loud cars or motorcycles each morning would make for an early morning wake up call that would overpower the ocean sounds. The other is the neighboring house about 25' to the south. Neither have anything to do specifically with this house other than being unexpected based on pictures or descriptions. The house was very well stocked and better than expected in that respect. The interior is dated, but it is part of the charm of this beach house. Great accommodations and wonderful location. A lot of extras available for recreation, which was really appreciated. We had a glorious week's vacation in the house. The house comes equipped with all the amenities and has a warm and welcoming feel to it. We were able to snorkel, boogie board, have beach towels, chairs, and an ice chest without breaking the bank and buying everything over there. Sitting on the front patio or down below to watch the sun rise or set was awesome. My kids fished and snorkeled right in front of the house, while I was in the comfort of my beach chair. They saw an eel, tons of fish and made many memories without having to load up the car! We could not have asked for anything better! I hope to be able to go back to the house for many years to come! Thank you Ted for sharing your beautiful home with us!! Nightly rate is for 4 persons. Add $25/night for each additional person.